Catamaran Sailboats at TheBeachcats.com :: Catamaran sailing repair tips, pictures, forums and classified ads catamarans for sale by owner Hobie, Nacra, AHPC, Solcat, Aqua Cat for sale. 2016 Steeplechase Catamaran Race, December 10-11, Islamorada to Key Largo and Back. The 32nd running of the Steeplechase was a challenge, and that’s just as it should be. This years event was won by the Team of Jamie Livingstone and Kenny Pierce on a Tornado in a fast total time for the two days of 7 hours, 48 minutes. Second was Ralph and Pat Cole on a Nacra 20 Carbon followed up by James Zelmer and Joe Velwave on a F18 (with a team name “Hobie 21”). 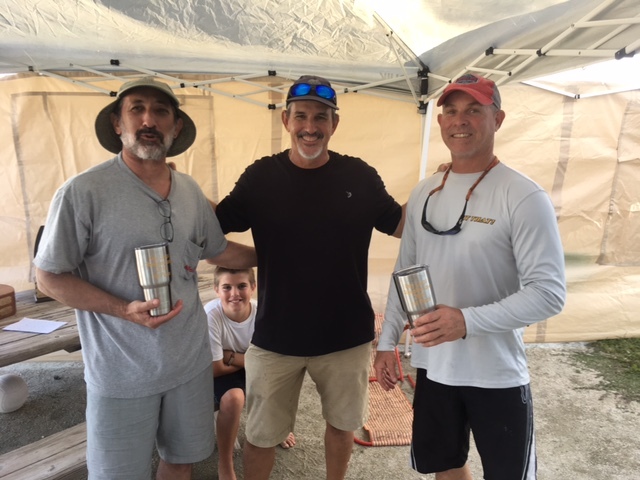 Special mention to the F18 team of David Reed and Mark Herendeen who, despite being demasted during day one, were able to recover and race the second day back from Key Largo. In the true spirit of endurance beachcat racing, other teams provided the needed parts and help to get them back on the water for Sunday’s start. Catamaran distance races are always exciting but the sailors planning to enter the 32nd running of this event had to consider very high predicted wind speeds and possible storms in the 120 mile path of the two day race. Seven teams started the race Saturday morning, headed for the first day finish at Key Largo. This was an experienced bunch, with a variety of boats, two F18’s, a Nacra Carbon 20, Tornado, Nacra 6.0, Nacra 20OD, and a Hobie 21. The actual conditions at the start were nice 12-18 winds from the SE but once the Magnificent Seven headed out the the winds greatly increased causing one team to turn back. A little later the team of David Reed and Mark Herendeen lost their mast due to a shroud failure. They were able to tie off to a crab pot and call for help and were rescued with no injuries. Notice of Race (NOR) and Online Registration are now available for the 2016 Hiram’s Haul.